The head is only 9 mm in diameter making it easy to use and ideal for canal treatment. Its slim design allows for easy access to posterior teeth with the ability to view directly of the treatment field. 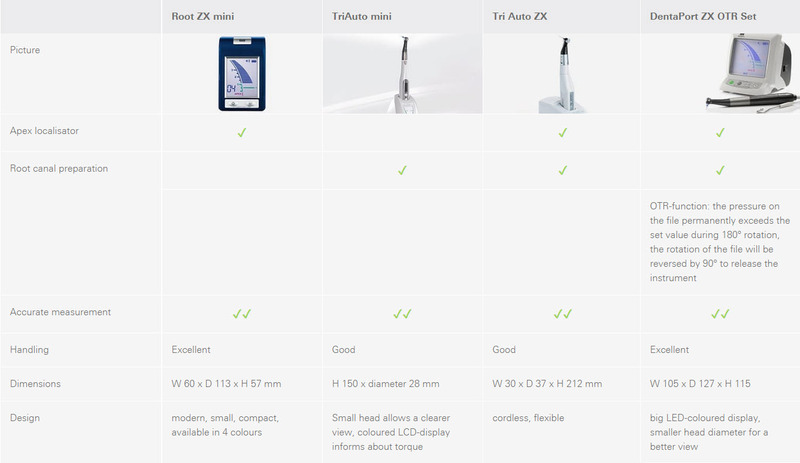 The TriAuto mini offers automatic controls for speed, rotation direction and torque that significantly increase the accuracy and safety of root canal treatment. The user can easily read off scales, figures and letters from the clear and simple display screen. If the user is left-handed, the display can also be reversed for their convenience. The LCD display has a backlight to make it easy to read. Changes in torque are not only shown with a meter, but can also be identified by a change in the color of the backlight. As torque increases, the color of the backlight changes from blue to green to red so that you can get a general reading with a quick glance. Also, the backlight flashes when torque reaches the set level. Display changes color: When linked to Root ZX mini, the display changes depending on the location of the file tip inside the canal to warn you and promote safe instrumentation. - The meter for file tip location appears in the display when the file is inserted in the canal. The meter moves along with the file tip to indicate its location inside the canal. - When the file reaches the apical region, the color of the display changes to green. - If the file tip goes beyond the apex, the color of the display changes to red. Eleven speed settings are available from 50 rpm to 1,000 rpm. This is extremely convenient for different types of files and varying treatment needs. The combinations for speed, torque and other settings can be programmed. Simply select one of the six memory numbers to switch from one combination to another. The appliance is upgraded with a measurement function if the TriAuto mini is connected to the Apex locator Root ZX mini via data transfer cable. With this, safety functions are made available which prevent over-preparation. I have had a TriAuto mini preparation motor for a large number of years. Can I combine this with a Apex locator to get file position displayed during canal enlargement? Yes. The TriAuto mini can be connected to the Root ZX mini apex locator using the connection kit (art. 6970-006). The Root ZX mini is available in four trendy colors: white (order no. 6951-110), red (order no. 6951-120), blue (order no. 6951-130), green (order no. 6951-140). Along with length measurement, this provides you with further interesting functionalities. I’ve got the combination system Root ZX mini with TriAuto mini preparation motor. Why does my measurement display cut out or function incorrectly sometimes? The file electrode wears away and has to be replaced regularly – about every six months or whenever it is extremely worn. Users can carry out this replacement themselves. Order 6970-004. Recently, it’s become necessary to recharge the battery more and more frequently. Can I change the battery myself? How long does a battery usually last? The power of the battery and battery charge display allow problem-free charging. When used frequently, an intact battery should have enough capacity for at least one up to several working days. It takes about 60 minutes to recharge completely. Should the battery’s capacity have dropped significantly, it can be replaced by the user without problems. Order 6440-820.